Tauranga’s premier fishing and boat charter company specialising in Game Fishing, Deep Sea Fishing, Diving, Sports Fishing and Sightseeing. Rely on personalised service for your day or overnight trip, or extended live-aboard charter, where novice and experienced anglers, dive enthusiasts and sightseeing groups are catered for. Sunfish Charters’ 12 m purpose-built Sportsfisher is a true blue-water charter boat designed for serious game fishing and offshore deep sea fishing. Licensed to carry up to 18 passengers in enclosed waters and 12 passengers offshore. This charter boat, with its 110sq ft cockpit can comfortably accommodate 7 anglers or 8 divers. While visiting the Bay of Plenty, take on the challenge of landing one of NZ’s big pelagic game fish: – blue & striped marlin, spearfish, yellow fin tuna, mako & other shark species as well as smaller fish like mahi mahi and tuna that make excellent eating. On extended charters, (weather permitting) night drifting is recommended for the elusive broad bill swordfish – one of the most powerful game fish (pound for pound) in the sea. If you are serious about big game fishing, then a 4 to 5 day game fishing safari is recommend to give you and your companions quality time amongst the big fish (while saving you money on your land based accommodation). Sunfish 1, based in Tauranga, carries a large array of electronic navigation and fish finding equipment together with the very latest and best Penn International reels and Kilwell “live fibre” game rods to maximise your chances of success. Target fast moving sports fish such as kingfish and trevally; enjoy the sport of a big kahwai on light tackle, or test your bottom fishing skills on snapper, terakihi, hapuka, gurnard, grouper and others. Get the best of both worlds with a 24 hour trip – fish the afternoons and changing light followed by a night drift for broadbill swordfish (weather permitting) then be in the right spot in the early morning to catch the best feeding time. Passenger Capacity: Half and Full Day Fishing = 12 people. Overnight = 6 people. What to bring: All you need to bring are some snacks or food and any alcoholic drinks together with your favourite music (CDs, DVDs, i-pods or Mp3 players). What is included: The price for fishing charters from Tauranga includes the use of the latest top class fishing gear for big game fishing, sports fishing and bottom fishing. About your guide: Your guide Darren Redman has a lifetime of experience fishing the remote lakes and estuaries of the Far South Coast. Being the first professional estuary guide in NSW let Darren’s 25+ years of experience in the trade, show you the art of catching estuarine fish in our area. 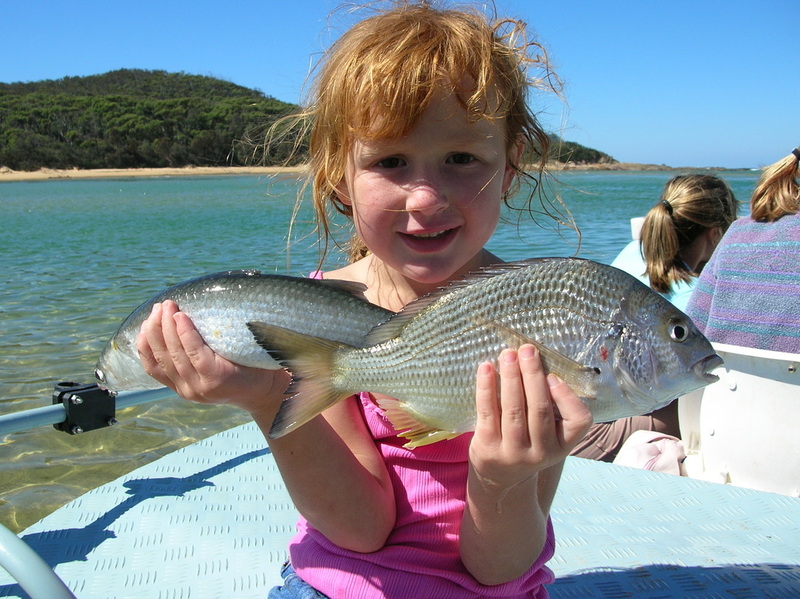 Our Guided Estuary Fishing Tours: Our family friendly estuary tours take place on a range of waterways including the Bermagui River, Wallaga Lake, Wapengo Lake, Tuross Lake, Nelsons Lagoon, Bega River and Wonboyn Lake. Our techniques include bait, sof and hard bodied lures, poppers and bladed lures, all dependant on the location and fishing conditions. Most importantly, we aim to improve your fishing knowledge and for those who haven’t fished before, introduce you to this great family friendly sport called fishing. On this guided tour we clean and prepare your catch for you at the end of the day. We also email your professional phtos at no extra cost. Inclusions: We provide all fishing equipment, lures, tackle and bait on a replace if lost basis. What to bring: We recommend that you bring your hat, sunscreen, and a camera. Just in case it rains, we recommend you bring a light rain jacket and something to keep your valuables dry. What is included: Fishing equipment, bait, hard and soft bodied lures, tackle and all the advice you require to have great day and catch some fish! Bagout Fishing Charters specialises in catching the prized Bluefin tuna during the late March-June period every year. With over 30 years of fishing experience we know exactly where to go and what methods to use in order to catch that big one! Trust experience and quality. What to bring: Bring all food, drinks, clothes, sunscreen, sun glasses etc.